Surprisingly, these are not quotes from today. Nope, they’re quotes taken from a story in The New York Times published on September 17th, 1985 that famously, and controversially, declared the death of country music, or at least that’s how the story got told as it set off all manner of scurrying and discussion in Nashville and beyond. In truth, The New York Times headline was “Nashville Sound: Country Music In Decline,” but the assessment might as well have been a death pronouncement. 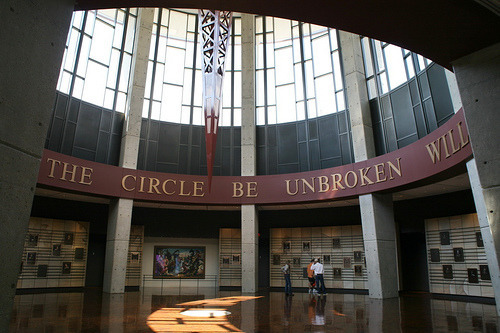 It was Bobby Bare who offered the first quote above, and famous artist manager Bill Carter who offered up the next two. The New York Times piece gave a grim statistical assessment of country music’s popular descent, citing the slashing of sales figures in both albums and singles from previous highs as evidence that the appeal of country music had dried up. And what did The Times link the implosion of country music to? The wide appeal of rock music among younger people, including younger listeners in America’s rural areas. And a loss of appeal for Music Row’s long-established “Nashville Sound.” Overproduction and cookie cutter songs had made country music bland and predictable. It wasn’t just that country music wasn’t changing with the times, it was that it couldn’t even appeal to its core constituency. It was stuck in popular music no man’s land and was getting left behind. Music was still being made though, and albums were still selling, however steep the declines were. What was successful in country music in 1985? 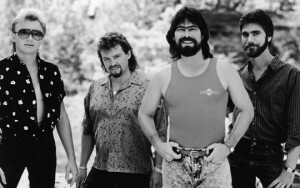 Alabama was one of the biggest bands during the year with #1 hits like “40 Hour Week,” “Can’t Keep A Good Man Down,” “(There’s a) Fire in the Night,” and “There’s No Way.” Alabama also won the ACM’s Entertainer of the Year in 1985. Another group, The Oak Ridge Boys, had three #1 singles during 1985, and Exile had two. It was the year of the group in country music, and “God Bless The U.S.A.” by Lee Greenwood was the CMA Song of the Year. That probably tells you just about all you need to know about country music in 1985: bland, dry, cookie-cutter music meant for commercial appeal (yet not achieving it). But among the ashes of what country music once was there were the chutes of green springing out of the ground that would help fuel the massive resurgence country music would enjoy in coming years. 1985 was the year Dwight Yoakam and Randy Travis began to emerge in the industry. The New York Times piece touted the rise of new traditionalists “such as Ricky Skaggs and George Strait, who are going back to the roots of country music for inspiration, and making simple, soulful records…” George Strait’s Does Ft. Worth Ever Cross Your Mind won the CMA for Album of the Year in 1985. George Strait and Randy Travis are given credit for helping to lay the groundwork for the now famous “Class of ’89” that included Garth Brooks, Alan Jackson, Travis Tritt, Clint Black, and others that brought country music back to commercial prominence, and to levels never seen before in the genre. 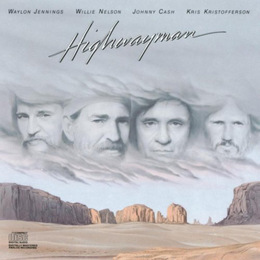 The Highwaymen released their first album, and had a #1 single in 1985. Another bright spot in 1985 was legendary acts. It was the year the supergroup The Highwaymen emerged (Willie Nelson, Waylon Jennings, Johnny Cash, Kris Kristofferson), though admittedly its formation was an effort to help combine star power in answer to their own sagging sales numbers. But they had a #1 song in 1985 in “Highwayman” (it also won the ACM Song of the Year)—once again reinforcing that 1985 was the “Year of the Group” in country music. The New York Times wisely pointed out in the 1985 article, “Some performers associated with country music have become American legends, figures whose voices are recognized everywhere – Willy Nelson, Dolly Parton, Ray Charles. As such, their careers may be immune to the crisis in country music’s mainstream.”—yet another assessment that is eerily relevant today. Right when things appear the most bleak, country music comes roaring back, led by a new generation of traditional artists. This was the case in 1975 with The Outlaws, in 1985 with the new traditionalists, in 1995 with the neo traditionalists, and in 2005 with Taylor Swi . . . oh wait. But who knows, we could point back to 2015 in the future to artists like Sturgill Simpson, Jason Isbell, Chris Stapleton, Mo Pitney, and many more who saved the day during one of country music’s darkest hours by going back to the past to remind us why great country music will always remain relevant into the future. What I really want to know is how Jaws 19 turned out. Can that be a movie please? Just picked RDJ he’s my favorite actor lol. Who will play Zac Brown: Scott Borchetta’s leading henchman? The idea in the script is that Zac Brown is kind of like Doctor Octopus in the second Spider Man film: where you know he’s capable of tremendous good, but also the worst evil imaginable and, since being kidnapped and re-programmed by Big Machine, is as wicked and ruthless (but also charismatic and wears the “Aw shucks!” public facade well) in his assaults against country music and anyone who dares to try and preserve/restore it. Uhhh dark one lol, but maybe when all hope seems lost, in the last act of the film, Zac gains awareness and helps Kyle save the day! Based on apparence with the beard and such, Zach Galifianakis(sp?) comes to mind, he was the guy that was in Due Date with RDJ. Excellent article. This type of thorough research and deep knowledge of history is one of the most appealing aspects of SCM. Sorry, ignore the “2011” at the end of my comment. Interestingly, the 38-year theory also predicts the “adult-contemporary” phases in country music. The period from the late 1950s until the mid 1970s was dominated by the Nashville Sound, which paralleled the “beautiful music” of that era. Flash forward 35-40 years, and one realizes that the period from the mid 1990s to the beginning of the 2010s was also dominated by adult-contemporary music that paralleled soft-rock/AC radio music. Just like the Outlaw movement was primarily a backlash against the Nashville Sound, the bro-country movement was a backlash against the recent adult-contemporary country phase. What worries me (I can be set straight regarding this, as I don’t know the statistics in depth like so many of you do, one thing I surely appreciate about the commenters here) is that I can’t recall a time when the country music industry so openly and unapologetically marketed to the youth demographic, who aren’t known for having much knowledge of or appreciation for the roots and tradition of country music, these days-it’s like a mantra to hear that country music must “evolve”, which seems to mean it must become a part of the homogenous sound which consists of what appeals to that demographic. It’s kind of like, the more I hear that “diversity is our strength”, the more that I see actually happening is the extinction of diversity. The things which make country music a distinctive genre are the things this target market soesn’t seem to want to hear in the music. Someone in a country music documentary I saw said it well (and this documentary was from the late 90’s, I believe)-the new slogan on country radio was “this isn’t your father’s coumtry music anymore”, and the guy made the point that for the first time, country music had been cut off from its roots and its past-he was saying this back in the 90s. That’s what worries me, that the roots and past and the storied history of country seems to have been so completely dismissed, just sliced right off from the whole genre, and IMO, country music absolutely cannot exist without its past, even if that past is constantly being built upon and taken in various directions-it still needs to always be reckoned with and taken into account. Ignore that “K” comment I was about to type something up but it expired. So are you trying to say that we’ll have to deal with the current country music phase till 2023? Going by the experience of 35-40 years ago, the party songs will fade fast, then we will go through a down time in country music when the genre finds itself in a tailspin commercially and rudderless creatively (it looks like we may already be in such a period now in the post-bro era). Ironically, that very lack of direction will serve as fertile ground for planting the seeds of a new traditionalist form of country, and those crops will come into full bloom commercially in the early-to-mid 2020s. You gotta give it to Alabama, those are some sweet mullets!! The difference, at least to me, is that even at their worst Alabama remained “mostly” country. And George Strait, Randy Travis and Ricky Skaggs, who were very country, made their careers not by being Country, but by being talented and making quality music. It seems that the “post-bros” (Pardi, Pitney) have put the country back, but they haven’t found the quality yet. And can we please get a new Country singer who’s over thirty? These slicked hair and muscle shirt pretty boys just look ridiculous. Pardi’s songs so far are somewhat gimmicky, but Pitney’s songs (at least the ones that I have heard) are consistently featuring true depth. Also, for the record, Jon Pardi is 30. Randy Travis, on the other hand, was in his 20s for almost all of the 80s when he enjoyed his peak years. Ironically, even though country fans have become significantly younger, the average age of male singers in their peak has not changed much at all. Mo Pitney hasn’t found the quality yet? That’s your opinion so I can;t argue with it, but I definitely disagree. Mo Pitney is the outlier. I hadn’t considered Isbell or Simpson as a part of what I’ve started calling the “post-bro” sound, since they’re part of the independent class. But thank you for clearing that up. On the Mo Pitney thing: His quality is hindered, I think, by the efforts to make him radio friendly. All we’ve heard to this point is what Darius Rucker would call “Mo Pitney” lite. Considering the fact that he has 13 #1 hits, 14 Grammys and was the 1985 CMA Entertainer Of The Year, the country music community doesn’t really talk about Ricky Skaggs a lot. I know he moved on to bluegrass, but even the biggest country music nerds that I talk to don’t know who he is. Strange, considering that in his heyday, he was more popular than George Strait. In my opinion, the worst part about Ricky Skaggs’ career is when they overly popularized him because they had no other country male solo performers to push. There was some decent music in there, “Highway 40 Blues,” his cover of “Uncle Pen,” but some of that stuff felt very 80’s for a lack of a better way of putting it. In my opinion, it was his work with Emmylou, in the Clinch Mountain Boys, and later with all his bluegrass revival stuff where he shined the brightest. He makes an excellent side man, a great front man, but just a pretty good mainstream star. That’s a good point. Maybe it’s the fanboy in me, but I just figured anyone who could take a Bill Monroe song to #1 against all the Urban Cowboys would be revered a little more. However, I will contend the fact that he was kinda pushed onto the public. Why was it Ricky Skaggs and not George Strait? Or was it about equal? I think George Strait is who it ended up being after Ricky, because after 1986, Ricky’s mainstream radio career had a pretty steep decline and that’s when Strait and later Randy Travis came into full form. I wouldn’t be surprised if Ricky was happy about that. If he’d rather be a superstar instead of a star side player, he wouldn’t have spent the majority of his career pursuing the latter. That sounds about right. I was just a kid then and know about that just from what I’ve read. I am glad RS didn’t pack it in after his mainstream career, though. And then there’s the album he did with Tony Rice in 1980 or so. Great stuff. Yes. It’s all that periphery stuff he does that in my opinion makes Ricky Skaggs a country music god in my eyes. Not to knock the #1 because there’s good stuff there too. His rendition of “Talk About Suffering” gives me goosebumps. And I love his version of “21 Fiddle Salute”. Heck, I love everything he’s done, for me, he can’t put a foot wrong. It was his first real hit, and was originally a Flatt and Scruggs tune. I especially like the mandolin and dobro jamming at the end. Now, try and imagine something that sounds like that playing on country radio today. Also, I guess the message of the song sort of doubles as a message directed at country music itself, both in the early 80’s and today. It’s strange to realise that Ricky Skaggs is now almost in the “elder statesman” category for country music. One of my favorite artists, and one of the main reasons I conceived a love for bluegrass. Almost an elder statesmen? Ricky Skaggs is over four years older than Marty Stuart, four years older than Alan Jackson and almost five years older than Randy Travis. He is, however, slightly more than two years younger than George Strait. I would consider Ricky Skaggs on a level with Marty Stuart. They both have a massive knowledge, appreciation, and – maybe most importantly – respect for the history of country music, in all its different forms. Wasn’t Keith Whitley also emerging around that time? It seems like he represented a link in the chain to country music’s history that was severed when he died in the late 80’s, just as he was really coming into his own as a country music star. Also, I believe Steve Earle was another guy who debuted in country music in 1986. I know his career as a mainstream act was brief, but he actually had some hit songs at the time, including two in the top ten. I think Cass County has helped, but these things are hard to gauge in the here and now. You really need the perspective of time to really understand how the shifts in country music have happened. It might just be right now that we fully understand what was going on in country in 1985, and as time goes on and country continues to go through changes, we’ll probably understand even more. Or we could be looking back to 2015 and see Kane Brown haha. Its looking like he’s officially the next big thing. Kane Brown? Is he anything like Luke Shelton? Chase Swindell? Bryant Aldean? or Cole-Georgia Line? Oh yeah, it looks like they’re multiplying. Of course that’s like trying to float the Titanic by putting more holes in it. Geez, where do the mamas get those names from? I guess from birth they were groomed for country music. When is Mo’s album coming out? This just proves the same argument happens over and over again in Country Music. My opinion is that country music was dying in 1991. The reason why (1991) is Older country singers quit having hits, most of 70′ and 80’s country quit having top 40 hits, and tons of new artists having top 10 hits since 1991. 1991 was when the “Class of ’89” was arguably at its commercial peak, and this was when many of the older stars got crowded out, so I’d say that’s not a bad assessment. I agree and I love the country music of the 1990’s even before that. Country music had best selling cd’s during the 1990’s even record breaking charts during that decade. Thanks for the feedback Trigger. On what planet is God Bless the USA a dry, cookie cutter bland country song? It’s a beautiful song, both lyrically and musically (especially the gorgeous piano instrumental). However, it is not country, either in sonic or vocal style. It is very much in the vein of soft rock. To be fair, there are some country elements in that song, especially in the fiddle parts, but overall it is very much soft-rock and was targeted to a broad national audience. Oh, I don’t agree that it is bland or cookie-cutter at all. It is truly a timeless anthem. Can we all go back in time in 1985 please? Why so much disrespect for Alabama, The Oak Ridge Boys, and Lee Greenwood? I get the cyclical argument you’re making. I despair of mainstream country radio ever being good again, but I hope you’re right that some sort of change is in the air and that bro-country is soon destined for the garbage heap where it belongs. But Alabama, Oak Ridge Boys, and LG are in no way akin to the crap that dominates country radio today. Each of those acts had great songs, some of which were genuine country and others that were more rock or pop tinged. Maybe some political baggage is attached to “God Bless the USA”, but put that aside and recognize it for the good song that it is. To suggest that those three are the 80s prerunners of the Bryan-Aldean-FGL garbage of today is deeply unfair. If that wasn’t your intent and I misread what you wrote then I apologize. I totally agree all three of those acts had some great songs. I also think Alabama, when you put their entire body of work together, was overall pretty mediocre when you compare them to other acts who dominated the genre in previous eras. That doesn’t mean they didn’t have their moments because they did. As far as comparing any of them to Bro-Country directly, that was not my intent whatsoever. You might see some precursors between Alabama and Bro-Country, like the listing off of country-isms instead of telling stories in song, or cite the fact that so many Bro-Country acts directly name Alabama as an influence in lyrics in songs. But no doubt Alabama’s output was still way better than Bro-Country.